Mérida is located only a few miles away from the Gulf of Mexico. The once prominent Mayan city became a dream destination for people of many nationalities including Spain, Britain and France at different points of time in history. Many of them made Mérida their permanent home and remained here. Consequently, beginning with the Mayans, its thriving urban vista is studded with architectural exploits of people from various parts of the world. 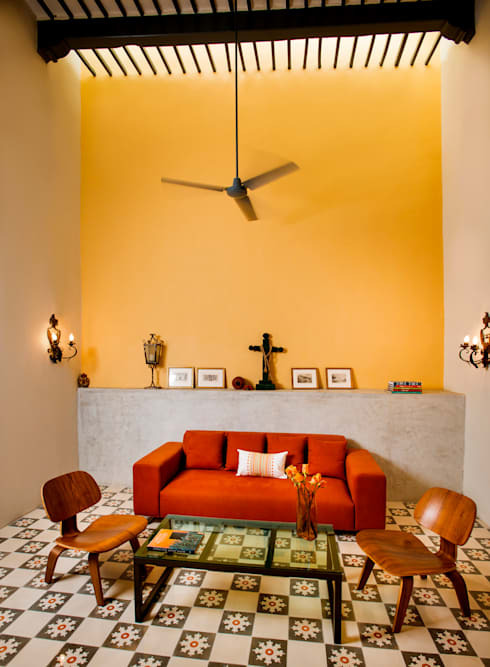 So, when Taller Estilo Arquitectura decided to build a modern house for one of their clients, they need not look further away from the city’s limits for inspirations. It is not an unusual task for them either. 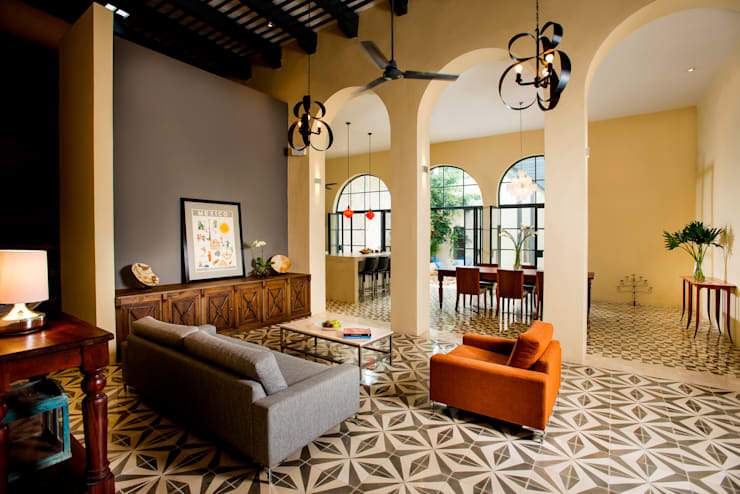 For about ten years now, Taller Estilo Arquitectura is creating a number of commercial and residential projects that are modern yet rooted in the traditions of Mérida. This project for Casa WS52 also proved to an extension of their already hard earned knowledge and expertise. 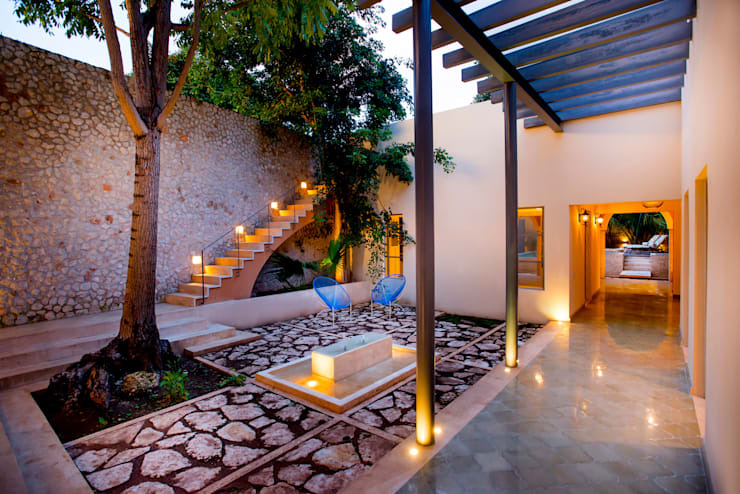 Today, we will try to make you familiar with the architectural and decorative nuances of Casa WS52. 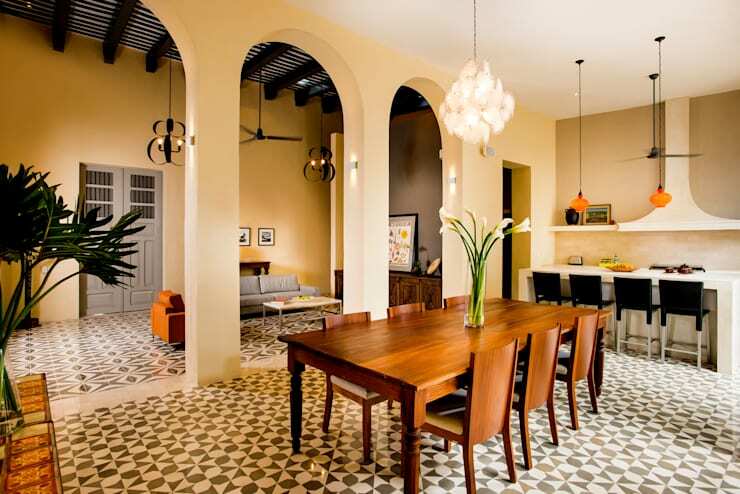 This part colonial part traditional structure is built around a small courtyard which occupies the central position of the entire living space. Those entering the building from the outside as well as the inhabitants themselves need to travel through a covered corridor to reach the various private and public sections of the house. The lounge shares it space with the kitchen and dining parlour. This is an expansive area made doubly special by the high ceiling which comes in handy during the warmer time of the year. It is mostly decorated with traditional wooden furniture, classy console tables and sofas. The florid tile pattern makes it look gorgeous. Pendant lighting fixtures, also in floral shape, add a touch of modernism. Casa WS52 also boasts of another smaller but intimate living room. It is decorated with furniture, sofa and decorative features in vibrant hues or natural wood tone. The yellow accent wall and the exposed wood beams give it a rustic charm. Apart from the very busy geometric tiles and pendant lighting fixtures, the kitchen wears mostly a neutral white and beige look. Thanks to the large doors opening towards the courtyard, it receives liberal amount of natural light. Besides, this space too is generously proportioned which makes it rather a comfortable room to be in. The dining area is a part of this free flowing space and faces the formal lounge. The traditional wood dining table accompanied by very stylish chairs remain in the focal point here. Wall mounted bar station can accommodate additional guests if needed. In one part of the spacious corridor a pantry and breakfast parlour have been set up. 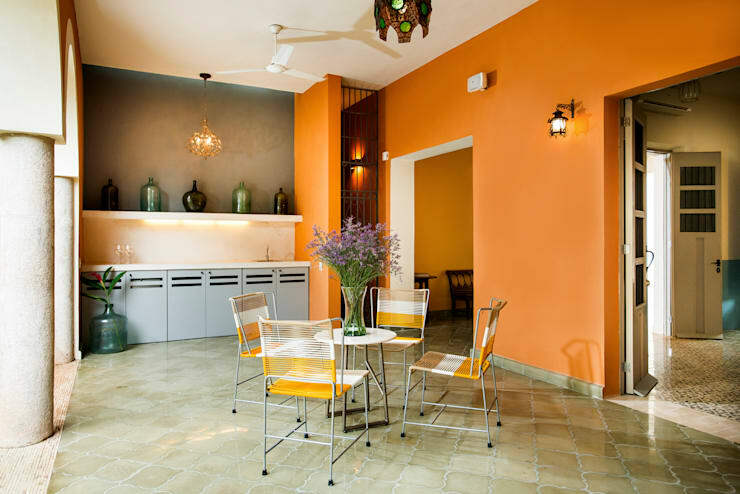 Lightweight chairs and a small round table, wall mounted cabinets and a strikingly colourful chandelier deck up this place. Apart from a four poster bed, the master bedroom has hardly any prominent furniture or show pieces to boast of. 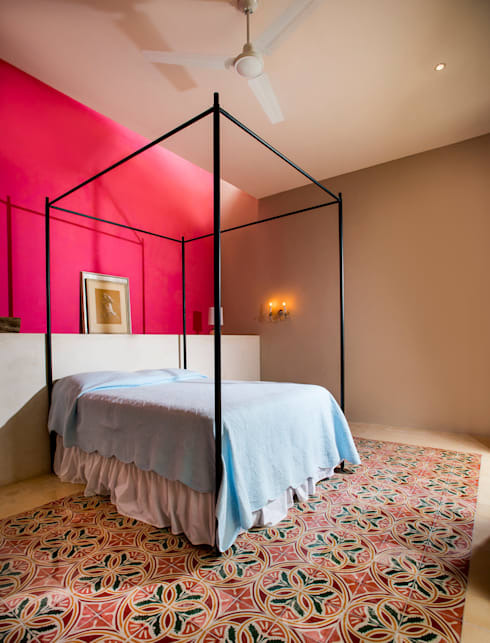 But courtesy the colourful floor tiles and a daring pink accent wall, it manages to look dazzling anyway. 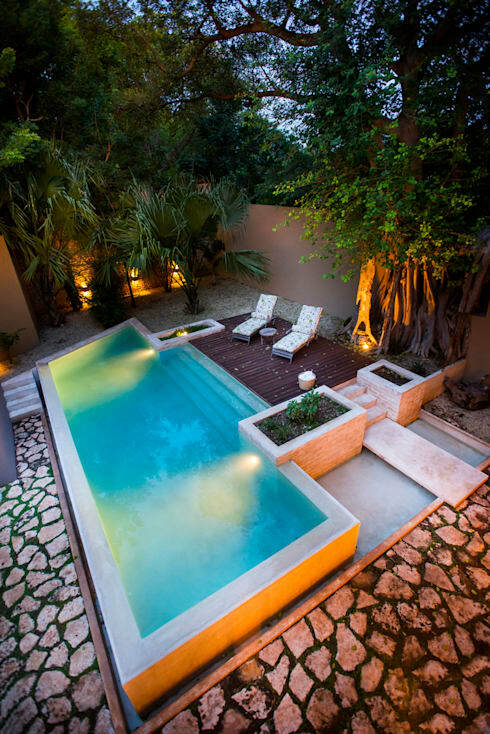 This space is almost thrust into the backyard, though it is easily reachable from the private quarters. 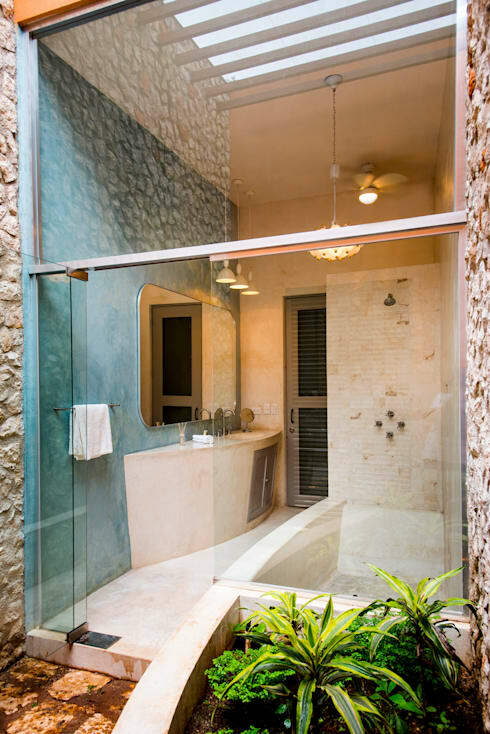 It is more a glass box decorated with chic vanity unit, large mirror, lighting fixtures and bathtub than a complete room. Even the roof above is replaced with trellises. 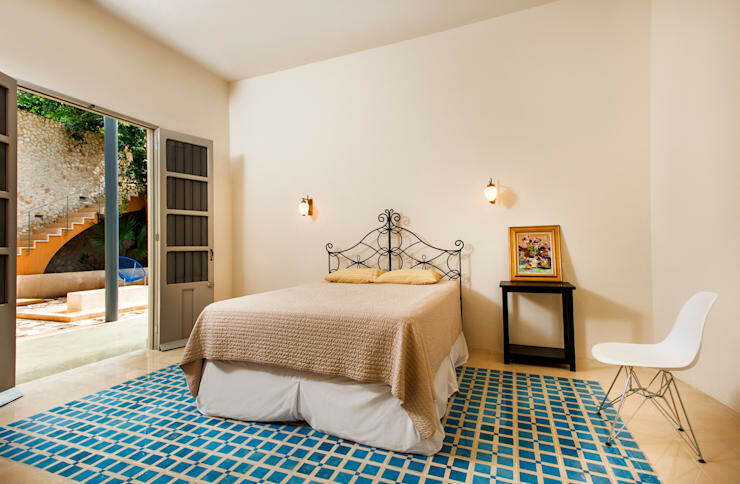 The second bedroom is smaller in size than the master bedroom and has even less ornamentation. 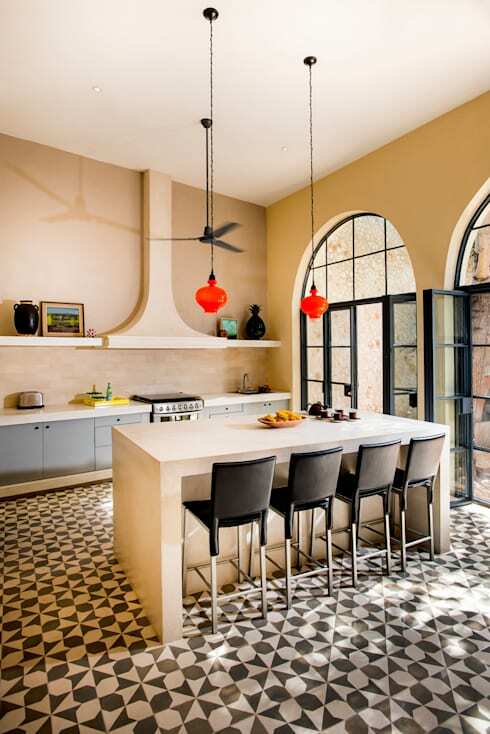 Though intricate yet the tiles on the floor too wear somewhat of a minimal look. Its door opens towards the courtyard. 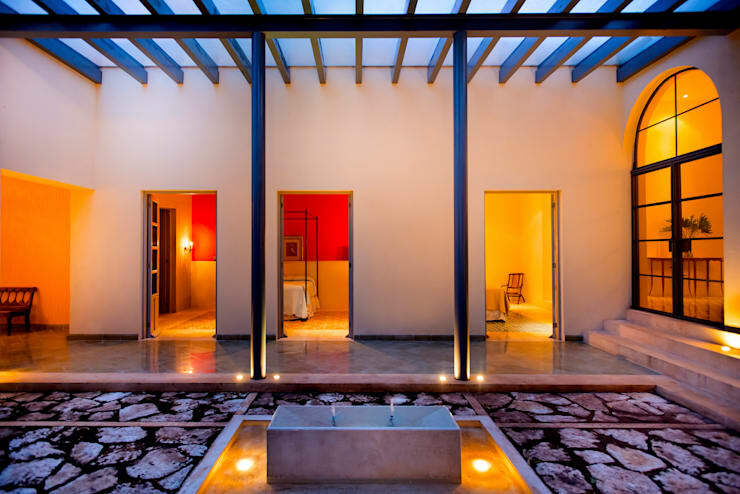 Both the courtyard in front of the building and swimming pool complex at the back, allow direct contact with nature. Due to its smallness of size outdoor furniture is limited to a couple of chairs. It has a fully functional fountain. The floor is embellished with boulder rocks. The tree and smaller shrubs perform their part in beautifying the area. This part of the building has elaborate arrangements for outdoor entertainment. The swimming pool allows cool splashes year long. It is surrounded by tropical trees. Like the courtyard in front the floor is made of irregular boulders. A slightly elevated deck is supplied with a couple of lounge chairs to relax on and appreciate the pretty face of the sky.